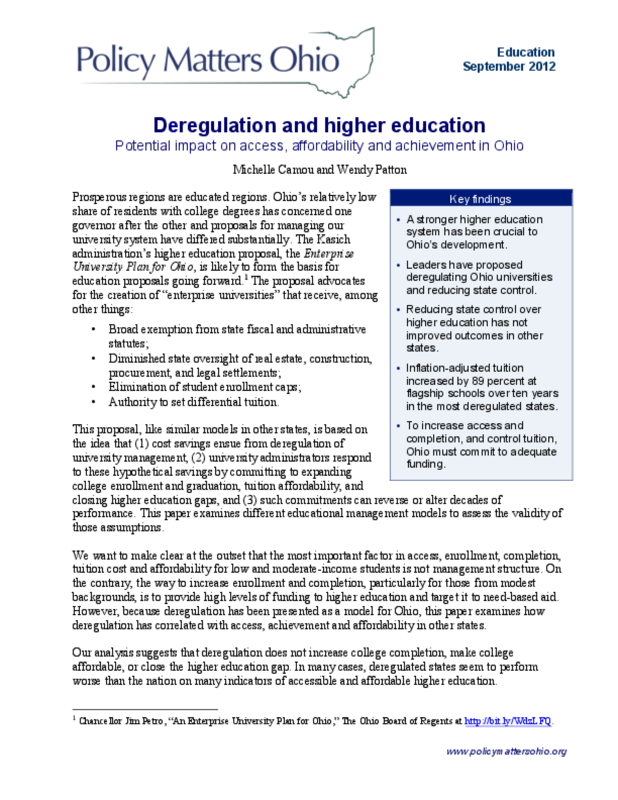 This paper refocuses attention on the importance of supporting Ohio students. States may appreciate deregulated higher education because, like other forms of privatization, it reduces support, responsibility and oversight. University administrations may see opportunities to raise revenues through real estate deals, parking arrangements, subcontracting, reducing staff compensation, and changing other employment relationships. Private contractors and the business community may favor these arrangements because there are lucrative possibilities for contracts, real estate deals and other arrangements. But the point of the system is not to serve the needs of legislators, administrators or contractors -- it is to educate students. Students, families, employers and taxpayers need a vibrant higher education system capable of delivering affordable academic programs that connect to the 21st century economy. Copyright 2012 Policy Matters Ohio.